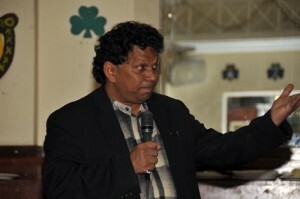 David Dabydeen was born on December 9, 1955 to Krishna Prasad and Vera Dabydeen, the parents of a peasant family, in a county in Guyana named Berbice. Until 1966, Guyana was a British colony predominantly inhabited by Africans and Indians who immigrated to the Caribbean during a massive movement, which transplanted more than half a million indentured Indians between 1838 and 1917. Dabydeen’s family moved several times during his early years to avoid race riots between Indo-Guyanese and Afro-Guyanese. When he reached his tenth year, he journeyed to the capital city of Georgetown to further his education in accordance with a full scholarship. There, he met some British teachers whom he would praise as his inspiration for writing throughout his life. Young David spent a few years boarding in various homes until 1969, when he left for England. His parents had separated, and his father had gone ahead to England in order to raise sufficient funds to send for his family. Each child from eldest to youngest went in turn. Dabydeen earned a Bachelor of Arts with honors from Cambridge University in 1978 and his Ph.D. in eighteenth century literature and art from the University of London in 1981. While at Cambridge, he wrote the poems which were eventually published in his first book, Slave Song, some six years later in 1984. He continued his studies at Oxford and Yale from 1983-87, lecturing on Caribbean Studies. He is a Professor at the Centre for British Comparative Cultural Studies at Warwick University. David Dabydeen made his poetic debut with a book titled Slave Song. Most of the poems had been written six years prior to its publication in 1984. The encouragement of friends drove him to seek literary representation. The language found in the poems is accentuated and spelled especially to recreate Guyanese Creole, which is a mixture of French, Spanish, and African and Caribbean tongues. Dabydeen intended for the poetry to be read aloud so as to illuminate the accent, emotion, and spirit of the culture of the language of the cane fields. In 1988, Coolie Odyssey followed Slave Song, receiving less acclaim and no awards. However, the strength and depth of the poetry never diminished. Although Dabydeen chose to write his second collection almost entirely in English, “the rhythm of the line and the sound of the poem are Caribbean” (Binder 171). The book paints a picture of the relationship between the white colonialists and the indigenous South Americans. Several poems outline one specific character at a time on a Guyanese plantation, presumably where Dabydeen spent his early years. By surveying the scene, the life, and the history through the eyes of so varied a crowd, Dabydeen brilliantly describes the setting of tragedy, rage, sorrow, oppression, and culture which pervade the endless fields of sugar cane. In revealing the minds of slaves and narrating from an aboriginal perspective, Dabydeen also opens the reader to issues of the land, demonstrates the results of colonialism on the native people, and addresses the intensified bond of the Guyanese to their pasts. The poem “Coolie Mother” touches upon language and education as pertains to identity and cultural mixture. A mother tells her son that he must read books, that he “got to go to school in Georgetown,” so he does not become a drunk cane worker (16). One sad aspect highlighted by the influx of British culture to a previously sheltered land is the discrepancy in technology and its culture. Ultimately, the less developed of the two gravitates toward the other, due to force or choice. The mother in the poem wants her son to learn English and get an education so he can escape the generational cycle of the cane fields. Conversely, the poem on the facing page is told from the perspective of that son. His language never deviates from Creole. He has not lost his native tongue. All native persons in a colonized environment must struggle with their sense of identity and self-composition. As Dabydeen noted in an interview, “We always felt ashamed (of women wearing saris) and we would talk about that to each other. As boys, we wished women who spoke in Urdu in public would keep quiet” (Binder 161). Certain shame and embarrassment accompany being a part of a foreign culture in England. Foreigners wish they could blend with the domestic people, become more like them. Another theme which prevails and re-emerges in several of the coolie poems is the sexual tensions and relationships between races. In “Untouchable,” the male slave knows that the white woman should never have any relations with him, but wants her anyway. Two consecutive poems are entitled “Miranda and Caliban.” Caliban is a slave and Miranda a white woman, characters appropriated from Shakespeare in a classic myth of the Guyanese plantation. They continue to indulge their sexual desire for each other, but must hide the truth from everyone and live in the shame of impurity. This self sustaining trap keeps the two at risk of death (see V.S. Naipaul, Frantz Fanon). Binder Wolfgang, “Interview with David Dabydeen, 1989.” The Art of David Dabydeen. Ed. Kevin Grant. Leeds: Peepal Tree, 1997. Dabydeen David. Coolie Odyssey. London: Hansib Publishing Limited and Dangaroo Press, 1988. Slave Song (poems). Mundelstrup: Dangaroo Press. 1984. Hogarth’s Blacks: Images of Blacks in Eighteenth Century English Art. Mundelstrup: Dangaroo Press.1985, Athens: University of Georgia Press. 1987. (Editor and contributor) The Black Presence in English Literature. Dover: Manchester University Press. 1985. Caribbean Literature: A Teacher’s Handbook. London: Heinemann. 1986. (Editor) India in the Caribbean, University of Warwick. Coventry: Centre for Caribbean Studies, 1987. Hogarth, Walpole, and Commercial Britain. London: Hansib Publications,1987. (With Nana Wilson-Tagoe) A Reader’s Guide to West Indian and Black British Literature. Dangaroo Press. 1987. Handbook for Teaching Caribbean Literature. London: Heinemann, 1988. Coolie Odyssey. (Poetry). London: Hansib Publications, 1988. (Editor with Paul Edwards) Black Writers in Britain, 1760-1890. Edinburgh: Edinburgh University Press, 1991. The Intended. (Novel). London: Minerva, 1992. Disappearance. (Novel). London: Secker & Warburg, 1993. Turner: New and Selected Poems. London: J. Cape, 1994. The Counting House. (Novel). London: J. Cape, 1996. (Editor with Brinsley Samaros) Across the Dark Waters: Ethnicity and Indian Identity in the Caribbean. London: Macmillan, 1996. A Harlot’s Progress. London: J. Cape, 1999. Our Lady of Demerara. Chichester: Dido Press, 2004. Molly and the Muslim Stick. Oxford: Macmillan Caribbean, 2008. The First Crossing: Being the Diary of Theophilus Richmond, Ship’s Surgeon Aboard The Hesperus, 1837-8 (co-editor). Coventry: Heaventree Press, 2008. David Aberdeen’s poetic debut ‘Slave Song’ was some of spatial in 1984! I read the Disappearance back in 2016 and I was really excited. The Slave Song of David Aberdeen is another great addition to the culture. A great person of Guyana culture. Love to read about him.